Greek National Tourism Organization approved. "Katerina’s Cottage" is located within the picturesque mountain village of Makriotika, on the slopes of the mountain ‘Agia Dinati’, offering a quiet stay in a lovely rural setting - away from it all but easy to reach places of interest - and the opportunity for you to experience the serene greek rural life. Because of its elevated location the cottage overlooks the valley of Pilaros with stunning panoramic mountain and sea views. Those who love nature and hiking will discover beautiful walking trails throughout the surrounding small villages and mountains in the valley. Within a short walking distance you will find Makriotika village square with a mini market, a cafe or indulge in traditional dishes at the local taverna. Supermarket, bakery and gas station can be found in approximately 1 km. The quaint village of Agia Effimia, a 5 minute drive, offers all amenities from supermarkets, bars, cafes and tavernas to atm machine, pharmacy, tourist information and car/motorbike/motorboat rental places. There are numerous beautiful pebble coves for you to enjoy your swim and scuba diving lessons can be booked. Other outdoor activities, such as horseback riding, water skiing, are provided in the area. Within a 10 minute drive you reach the amazing Myrtos beach famed for the beauty of its blue water (voted one of the top ten beaches in the world). 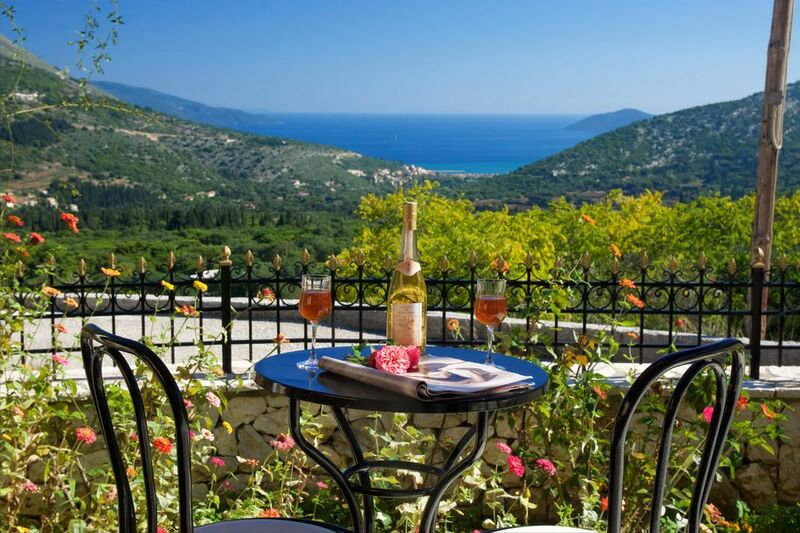 Makriotika and "Katerina’s Cottage" are an ideal base for exploring Kefalonia. The village itself is in a great central location regarding distances, giving easy access to all areas of the island, especially the northern part of the island (Agia Effimia, Sami, Assos, Fiscardo, Myrtos beach). There is one bathroom with bathtub, shower, washbasin, wc and washing machine. All rooms of the property have individual air condition units. All linens are provided and can be changed by the renters whenever they like, without the need of having to clean them. There is private parking space for two cars within the property land and inside a gated entrance. Towels (excluding beach towels) are provided and can be changed by the renters whenever they like, without the need of having to clean them. The spacious living room has two sofas, cable TV, air condition unit, internet access and patio doors that lead to furnished balcony and veranda with unique sea and mountain view. Open plan fully equipped kitchen has frige/freezer, kitchen utensils, hob/oven, microwave, coffee maker, toaster, kettle and is open to the dinning & lounge area with patio doors to furnished balcony. Inside and outside dinning area for up to 6 guests. Furnished balcony offering unique sea and mountain views. Stone made veranda with a large umbrella and sun beds for relaxing. We had wonderful 2 weeks in Katerina's cottage in a small mountain village. It was very well equipped, a real home from home, a lovely place to relax with wonderful views down to the coast. Sophia, who looks after the property is a really friendly person and was very helpful with information on places to visit. We would definitely recommend anybody thinking of going to Kefalonia to consider this property. Thank you for taking the time to write this review for "Katerina's Cottage", we really appreciate it. Your opinion is important to us and we are happy to hear you enjoyed your stay at our cottage. It was really nice meeting you and we are looking forward to welcoming you again in the future. Great cottage with an AMAZING view! This cottage was absolutely perfect for our holiday to Kefalonia. The view from the deck was simply stunning. You just cannot get bored of such a breathtaking view each day and we loved spending time outside in the late afternoon as the sun went down watching the marina in the distance. We have family in Agia Efimia and so wanted to base ourselves near by for our holiday and it is in a perfect location. The cottage is in a lovely little town (Makriotika) with shop and lovely traditional taverna and Agia Efimia is only 5 minutes by car. You can also drive to Myrtos beach which is absolutely stunning and only a 10-15 minutes in the opposite direction. Having a car was pretty essential for us to get to these places and there are so many more you can visit whilst here. We went to Assos as well, which is beautiful. There is a driveway with electronic gate for the car. When we arrived, Sofia (the lady who manages the property) was easy to contact and met us at the cottage. She was excellent and very thorough at the start of the holiday and throughout to make sure that we had everything we needed. The service provided was excellent! Little extras like having spare towels and linen and a very good washing machine was great. The air conditioning was also excellent and cooled the place within minutes during a very hot summer. There was a BBQ on sight so we were able to use that when we needed although there are plenty of taverna's in Agia Efimia, which is a lovely town with marina, shops, bars, tavernas and beaches. Overall, this was a great cottage in a beautiful country close to everything you need. We would highly recommend the cottage and Sofia, who will make your stay a brilliant one. It was big and good value for money. Wonderful house in.a quiet village with a great view. The owner is very friendly and helpful and gave us a very warm welcome. Kefalonia itself is a quiet island with a lot of unspoiled places. Within a 10 minute drive you will reach Myrtos beach, voted one of the top ten beaches in the world and within 25 minute drive along the east coast you will find Antisamos beach (near the port of Sami) with stunning mountain view. In Agia Effimia, a 5 minute drive from Makriotika, you can choose from numerous beautiful pebble coves to enjoy swimming and snorkeling. Motorboats are available to hire to explore some more idyllic hidden little beaches that can not be reached by car. As you drive from Agia Effimia to Sami more small white pebble coves can be found along the way, ideal for snorkeling. Kefalonia Airport (EFL) is approximately 35 km from "Katerina’s Cottage" with flights from Athens and direct flights from abroad. The easiest way to come to Kefalonia is by direct flight to the airport of Kefalonia. If such a flight is not provided in your country, you can take a flight to Athens and then a connecting flight to Kefalonia. Alternatively, you can rent a car from Athens and drive to the ports of Patras or Kyllini. From those ports there are daily ferries to Kefalonia. Also there are direct connections with other Ionian islands. We will be glad to assist you on organizing your travelling. The port of Sami is 14 km, a 15 minute drive from where you can take a ferry to Patras, on the mainland of Greece, Italy and the island of Ithaca. A car rental during your stay is recommended in order for you to explore the island. In Agia Effimia you can either hire a taxi or catch the local bus to take you to Myrtos beach and the surrounding villages. Feel free to contact us for any questions. You will also find a tourist office in Agia Effimia for further information. 5 km (5 minute drive) to the beautiful harbour of Agia Effimia. 10 km to the underground Lake of Melissani, in Karavomilos. 14 km (15 minute drive) to the port of Sami. 16 km to the Drogarati Cave nearby Sami. 13 km to the quaint little fishing harbour of Assos with its Venetian Castle. *If you follow another route the distance from "Katerina’s Cottage" to Assos is 24 km, but the view along the way will be worth the drive. 32 km to the picturesque yacht harbour of Fiscardo with beautiful scenery and view while driving. 26 km to Argostoli, the capital of Kefalonia Island. 35 km to the Airport of Kefalonia. Makriotika village and "Katerina’ s Cottage" are located on the slopes of the mountain Agia Dinati, thus you can enjoy a serene and quiet stay with privacy in a peaceful environment. Nature lovers and hikers will discover numerous walking trails and unspoilt mountain roads leading to the other local villages within the valley. A walking trail leads to the holy monastery of Themata (approx. 4 km from the cottage) in such a location offering breathtaking views. A path from the monastery leads further up to the top of Agia Dinati mountain and its Aeolic Park. You can choose one of the paths through the valley that leads you to Agia Effimia. In Agia Effimia, a 5 minute drive, you will find many more traditional taverns, shops, bars/cafes, bakery, supermarkets, a pharmacy, atm machine, car/motorbike rental places and enjoy a walk along Agia Effimia picturesque fishing port and waterfront. A diving school is located in the village offering guided dives. In the summer time public festivals are held here and in the little villages in honour of the Saints of the Island Kefalonia. Here you can see how locals celebrate with traditional food, local wine and Kefalonian dances. Makriotika and "Katerina’s Cottage" are at the heart of Kefalonia island and is thus an ideal base for daily excursions to the villages, sightseeings and beaches of the island, like the famous Melissani Lake (just outside the village of Karavomilos) where a mini tour is done, the Drogarati Caves with stalactites and stalagmites still forming, the unspoiled, picturesque village of Assos with its Venetian Castle, the cosmopolitan harbour of Fiscardo from where you can take a boat to Lefkas, the stunning Myrtos beach, Antisamos beach and much more. A medical centre is located in Sami and from the port of Sami you can take the ferry to visit Ithaca island. A trip to Mount Aenos, Kefalonias highest mountain with unique protected fauna and flora, is recommended to enjoy spectacular panoramic views. Hiking to its peak is highly recommended for nature lovers and hikers. Visit the village of Frangata for some local wine-tasting. In the capital of Kefalonia island, Argostoli, you can visit the Archaeological Museum and Corgialeneion Historical and Folk Art Museums. You will find many shops and in the central square many restaurants, cafes and bars where much of the busy nightlife of the island is mainly been found. We can provide you with detailed advice and assistance regarding your holidays in Kefalonia. G.N.T.O. approved. License number: ΕΣΛ-0458Κ91000489501. In order to secure your booking, a reservation deposit of 25% of the total rental cost is required at time of booking. A reservation cannot be considered confirmed until a 25% deposit has been paid. Balance is to be paid 60 days before the day of your arrival. You should not consider the cottage booked if the balance is not paid 60 days before your arrival day and until you have received a confirmation e-mail from the owner. Cancellation Policy Must be in writing through e-mail. 60 days or more before the check-in date forfeit the 25% of total rental cost. 59 days or less before the check-in date forfeit the 100% of total rental cost. Changeover Day: Preferable changeover day is Sunday. However depending on season and booking situation, alternative days will be kindly considered. In order to prepare the cottage for other guests please kindly vacate the property by 10:00am on the day of your departure. The cottage will be ready for check-in at 2.00pm. Feel free to contact us timely and subject to availability, alternative check-out or check-in time will be considered. In order to secure your booking, a reservation deposit of 25% of the total rental cost is required at time of booking. Balance is to be paid 60 days before your arrival day.